Logitech speakers - 360 degrees of sound? 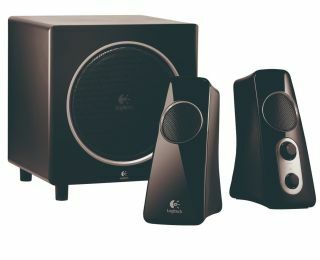 Logitech has unveiled its latest multimedia speakers, with four new multimedia speakers promising '360 degree sound'. The Logitech Speaker Systems Z320, Z323, Z520 and Z523 are all both Mac and PC compatible (which is not really very surprising) and boast 'omnidirectional acoustics' to give 360 degree sound. This is achived through speaker drivers that face both forwards and backwards in the satellites which, Logitech tells us, creates a larger sweet spot for your sound. "Many PC speakers focus sound in one direction, which is fine if you're always sitting in the same spot," said Mark Schneider, vice president and general manager of Logitech's audio business unit. "But now with 360-degree sound, whether you're listening to your favourite song on iTunes, watching a video on YouTube or playing your favourite game, you can enjoy rich, sound and minimal distortion throughout your room." The Logitech Z523 includes two sleek satellites and a 6.5 inch, downwards firing sub – and has 40 Watts of power. The speaker system is priced at £99 and will be available in September. The 30 watt Logitech Z323 is less powerful but has the same feature set as its 50W counterpart, which include integrated dual RCA jack and 3.5mm jack. It will cost £59.99 and is also available in September. The stereo Z520 system is a 26 watt system that is apparently 'suitable for a small party' although we're not entirely sure what number of people that means. The system will cost a not inconsiderable £99. The Z320 speakers are designed for laptops and the 10 watt system will be priced at £49.99. Both the Z320 and Z520 will be available in September.